Just over 72 hours since their last match, Torino will be back in action once again on Tuesday evening, as they make the long journey to Reggio Calabria to take on an in-form Reggina side. Torino will be forced to make at least two changes from their side who beat Empoli, as Alessandro Parisi and Juan Surraco have stayed behind in Turin and have not made the trip. Luciano Zavango should come in at left back, whilst Mirco Antenucci, who was impressive after coming off the bench on Saturday, could start on the wing. Toro will be facing a team that is in good form, as Reggina have won their last four matches, against Bari, Livorno, Varese, and most recently an impressive 3-0 away win at Brescia. However, it must be noted that in this last match, the Brescia missed two penalties, and despite having 66% of the possession, they still managed to lose the game. Although they did lose their last away match against Gubbio, Torino have been impressive on the road this season, winning all of their other five matches. Torino returned to winning ways and extended their lead at the top of the Serie B table, as they came from behind to beat Empoli 2-1 at the Stadio Olimpico. Toro made a number of changes to the side that lost at Gubbio, with Valerio Di Cesare, Migjen Basha, Juan Surraco and Giulio Ebagua all coming into the team. Torino had the first opportunity in the match after some incisive wing play by Alen Stevanovic enabled him to charge into the area and unleash a shot at goal that was tipped over the bar by Alberto Pelagotti in the Empoli goal. And the away side's keeper also did well to deny Rolando Bianchi, as he turned the Torino Captain's effort around the post. However, it was Empoli who took the lead just ten minutes before the half time interval, with a fantastic strike from Flavio Lazzari. The midfielder received the ball 20 yards out, and sold a fantastic dummy to get past Valerio Di Cesare who had attempted to close him down, before unleashing an outstanding left footed shot into the top corner. At half time, Giampiero Ventura brought on Mirco Antenucci to replace the ineffective Juan Surraco, and the former Catania man made an instant impact as just five minutes into the second half, Toro were level. Antenucci found himself with oceans of room on the left hand side in the penalty area, and got to the byline, before cutting the ball back to the grateful Giulio Ebagua who slid the ball home from three yards out. And Antenucci almost had a goal for himself moments later, as he curled a fantastic shot towards goal from just inside the area, but was denied by Pelagotti. However, Toro didn't have long to wait to take the lead because with 25 minutes remaining, they got their second goal from an unlikely source. A corner was whipped in from the left, and Rolando Bianchi's header was initially saved by the fantastic Alberto Pelagotti, however Matteo Darmian was the quickest to react as he hooked the ball into the net to give Toro the lead. Ferdinando Coppola redeemed himself for his awful error against Gubbio, as he made a good save from Mirko Valdifiori's shot, and at the other end, Bianchi and Antenucci both spurned chances to extend Torino's lead. However, in the end it didn't matter as Torino held on to the three points, and are now four points clear of Zdenek Zeman's Pescara at the top of the league, ahead of a difficult visit to Reggina on Tuesday. It will be interesting to see how Torino will react to their first defeat of the season when they face Empoli on Saturday afternoon. The defeat against Gubbio was obviously disappointing, but Torino still remain top of the league, and must get back to winning ways as soon as possible in order to stay there. Migjen Basha and Giulio Ebagua should return to the starting eleven after disappointing performances by their replacements - Giuseppe Vives and Alessandro Sgrigna. Toro will be eager to ease the nerves with an early goal on Saturday, as in their five previous home games they have only scored one goal in the first half - and that was in the 40th minute. Empoli have had a disappointing start to the season and despite being many pundits tip for a place in the the playoffs, they find themselves at the other end of the table, in 20th position. However, in spite of their lowly league position, in Francesco Tavano, Empoli have one of the in form strikers in the division - having scored seven goals already this campaign. Well the bubble had to burst at some point didn't it? And if you ask the majority of Torino fans, I doubt that they were that surprised that The Granata's unbeaten run was ended by lowly Gubbio. Before the game, players and fans of both teams paid tribute to MotoGP rider Marco Simoncelli who died in tragic circumstances at the Malaysian Grand Prix on Sunday. Toro had two good chances in the early stages of the match, with Rolando Bianchi, and then Kamil Glik going close with headers. It was Glik who then became public enemy number one amongst the Gubbio fans, after his reckless challenge resulted in Marcel Büchel being stretchered off. The home side had their best chance towards the end of the first half, but Alessandro Sandreani's shot was easily saved by Ferdinando Coppola. Fifteen minutes into the Second Half, Gubbio took the lead in comical circumstances after a poor mistake by Coppola. The on loan goalkeeper came out of his goal to try and intercept a long ball forward, but his clearance was a timid one that went straight to a Gubbio player. Daniel Ciofani was the grateful recipient of Coppola's gift, and he calmly side footed the ball into an empty net from 20 yards out. Torino had a number of chances in the final 30 minutes to equalise, the best of which falling to Rolando Bianchi, and he was unlucky to see his header hit the bar. In fact, Gubbio almost doubled their lead, as Mario Rui was equally unlucky to see his long range shot rebound off the post. In injury time, Torino had one last chance to maintain their unbeaten record, and once again the opportunity fell to Bianchi. And this time, Gubbio had their goalkeeper, Antonio Donnarumma to thank as he made a great save to tip Bianchi's header over the bar. Whilst Torino were certainly not at their best, they probably did enough to deserve a draw, and it was only due to a catastrophic error that meant they lost the game. However this match was a wake up call for Toro, and shows that no team in Serie B can be underestimated. Let's hope that Torino learn a valuable lesson from this match, and get back to winning ways against Empoli on Saturday. Torino will have to wait until Monday night for their game this weekend, as they face a visit to newly promoted Gubbio in search of their sixth consecutive away victory. Gubbio is a picturesque Umbrian town with a population of just 32,000 people, therefore the fact their football team has been able to reach their second tier of Italian football is an achievement in itself. However, Gubbio have had a difficult start to the season, and are currently 21st in the Serie B table, and would be bottom of the table if it wasn’t for the fact Ascoli have been given a points deduction. In an attempt to halt their slide down the table, earlier this week, Gubbio sacked their manager Fabio Pecchia. Former Inter coach Gigi Simoni, who had been the club’s technical director, will take charge of the match against Torino. Whilst the appointment of 72 year old Simoni is surely only a temporary measure, his experience could help a squad of talented players - including former Toro defender Simone Benedetti, fulfil their potential. Torino are boosted by the fact that they have no major injury worries for the match, and Giampiero Ventura will have a difficult team selection ahead of him. Kamil Glik impressed last week against Juve Stabia, so he may keep his place in the side, although that would be harsh on Valerio Di Cesare who has also played well when called upon. With a number of genuine wingers now available, Mirco Antenucci, who has recently been playing on the left wing, could change to his favoured striking role with Simone Verdi, Juan Surraco and Nnamdi Oduamadi in contention to replace him on the wing. Torino continued their impressive start to the season, as they beat a stubborn Juve Stabia side 1-0 to record their fifth consecutive victory and remain top of the Serie B table. There was a sombre atmosphere at the Stadio Olimpico on Saturday afternoon as a minutes silence was held to commemorate the lives of Lorenzo Ghedi and Fabio Massimo Pozzo who tragically died after they were involved in a collision with the Torino team coach on Sunday night. 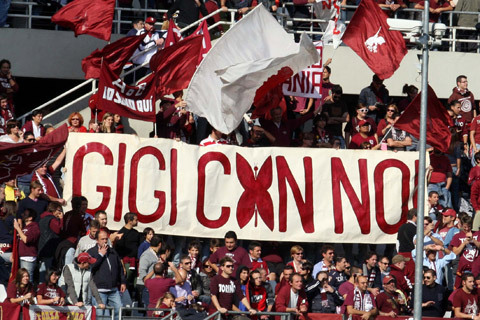 Torino fans also paid tribute to their former player Gigi Meroni, as the 15th October is the anniversary of his death. The enigmatic winger died in a road accident 44 years ago, and the man affectionately referred to as the 'La Farfalla Granata' (The Granata Butterfly) was commonly acknowledged to be one of the best players of his generation before his premature death, aged just 24. Torino made a number of changes to the side that beat Hellas Verona last weekend, with Alen Stevanovic, Giulio Ebagua and Angelo Ogbonna all coming in to the starting eleven. The first real chance of the match came after fifteen minutes, after nice interplay between Rolando Bianchi and Giulio Ebagua put Mirco Antenucci through on goal, but his shot was well blocked by the covering defender. In the opening seconds of the second half, the visitors almost took a surprise lead after a mistake from Kamil Glik gave substitute Jerry Mbakogu a chance to score, but his lob went well over the bar. Captain Rolando Bianchi almost opened the scoring for Toro, but his fierce shot from 20 yards went over the bar. Moments later, Alessandro Parisi almost came close to scoring his first goal in a Torino shirt when his free kick from 40 yards out was deflected, but Andrea Seculin in the Juve Stabia goal made a good save to deny him. Torino came close to scoring once again, this time it was Alen Stevanovic who did well to get to the byline and cut the ball back to substitute Alessandro Sgrigna, but unfortunately for Toro, Sgrigna lent back at the vital moment, and the ball ballooned over the bar. With ten minutes remaining, Torino finally got the breakthrough that their play deserved when the Poland International Kamil Glik delivered an inch perfect assist to find Rolando Bianchi, who peeled away from his marker to head into the corner of the net. Despite one nervy moment when a Ferdinando Coppola clearance rebounded off a Juve Stabia player to go narrowly wide, Torino held on for their eighth victory of the season - and thanks to Padova losing to Varese on Friday night, Toro are now six points clear at the top of the league. After last Sunday’s victory against Hellas Verona – a win that set a new record for consecutive away wins for the Granata , Torino will play another newly promoted side on Saturday, when they face Juve Stabia at home. Whilst this may not be the Torino – Juve clash that most Toro fans have become accustomed to over the years, Juve Stabia will certainly pose a tough test. This is their first season back in Serie B after a 59 year absence, and it is also the first time that these two sides have ever met in a competitive fixture. This match sees two teams in great form going head to head, as both Torino and Juve Stabia have won their last four matches. However, Juve Stabia have received setback in their quest to maintain their place in the second tier, as earlier this week, they were deducted five points for alleged match fixing of a game in 2009. However, as we have seen with Atalanta in Serie A, receiving a point deduction can have a positive effect on a team, and Juve Stabia will undoubtedly be eager to make up those points as quickly as possible, so Toro will have to be wary. The home side will be boosted by the fact that Angelo Ogbonna has returned from international duty and should return to the starting eleven. Elsewhere, Giulio Ebagua may also be in line for a start after his outstanding goal against Hellas, whilst Alen Stevanovic should also return having been rested. For the first time in their history, Torino have won five consecutive away games after Torino's 3-1 win in Verona. Incredibly, this means that this current Torino side (albeit in Serie B) has achieved a record, that even 'Il Grande Torino' did not manage. In the absence of Angelo Ogbonna who is away on international duty, Francesco Pratali came into the side for his first start of the season. Toro captain Rolando Bianchi also made a return to the starting line up, and Juan Surraco also made his first start for the club. The first chance of the match fell to the home side, and it was former Torino striker Sasa Bjelanovic who met Massimiliano Scaglia's cross, but his header was a tame one and Ferdinando Coppola saved it with ease. After fifteen minutes, Toro took the lead when Alessandro Parisi delivered a fantastic cross from the left wing that found Rolando Bianchi, who scored with a typically powerful header from twelve yards. Torino almost doubled their lead soon afterwards, when a clever free kick routine resulted in Manuel Iori delivering an inch perfect pass to Mirco Antenucci, but the strikers volley was turned over the bar by Hellas goalkeeper Rafael. Ten minutes before half time, Toro did extend their lead after an exquisite pass by regista Manuel Iori found Alessandro Sgrigna in the box, and although his initial shot was saved, he knocked in the rebound to give Torino a 2-0 lead. On the stroke of half time, Verona got a goal back after Mirco Antenucci lost possession on the edge of his own box, and the ball fell to Matteo Abbate who unleashed a fantastic long range shot from 25 yards, to give the home side a way back into the match. Mirco Antenucci had two chances before the half time whistle to re-establish a two goal lead, but he was unable to make amends, as Toro went in at the break with a narrow lead. Fifteen minutes into the second half, Giampiero Ventura replaced Alessandro Sgrigna with Giulio Ebagua, and the Nigerian born striker made an immediate impact. The former Varese player picked the ball up from 40 yards out and dribbled past the Verona defence, before finishing calmly with his left foot into the top corner of the net. The goal has been described in some match reports as being 'Messi-like' and it certainly was a goal the Argentine player would have been proud of. Unfortunately, a small section of Hellas fans lived up to their unsavoury repuatation by racially abusing Giulio Ebagua during the match, and Hellas Verona have since been fined €7000 because of the conduct of their fans. In the last half an hour, Hellas had chances to get a goal back, but Coppola made good saves to deny both Matteo Abbate and Emanuele Berrettoni, as Torino held on for the victory that kept them three points clear at the top of the table. The day ended on a sad note, as on their way back to Torino, the team coach was involved in a road accident, as a truck collided with a car that became wedged underneath the coach. No players or staff were injured, but sadly two people lost their lives - Lorenzo Ghedi, 25 and Fabio Massimo Pozzo, 31. R.I.P Lorenzo and Fabio, our thoughts are with your friends and family. Torino will play their third game in nine days when they face a difficult away trip to the Stadio Bentegodi to play Hellas Verona on Sunday afternoon. Torino were not at their best against a stubborn Grosseto side in midweek, but thanks to an own goal, they were able to get the victory that put them three points clear at the top of the Serie B table. Angelo Ogbonna is away with Italy on international duty, so Valerio Di Cesare is expected to come in, whilst captain Rolando Bianchi should return to starting eleven after being on the bench on Wednesday night. After being promoted to Serie B after an absence of four years, Hellas Verona have made a solid start to the season, and have twelve points from their eight games so far. Their home form has been particularly impressive, as although they were beaten at home by Pescara on the opening weekend of the season, they have beaten Sassuolo and held Padova and Sampdoria to draws. After speaking with Hellas fan Charles Ducksbury on Twitter, Toro fans will be pleased to hear that their top scorer Juan Ignacio Gomez will miss the game through injury. However, Croatian striker Sasa Bjelanovic, who once had a short spell at Torino, may be a threat. Simone Verdi and Nnamdi Oduamadi have returned to the Torino squad after injuries, and one of the two players may be in line to replace Alen Stevanovic who is being rested. Torino went three points clear at the top of the Serie B table after a narrow 1-0 victory against Grosseto on Wednesday night. Toro defender Angelo Ogbonna received some positive news before the game, as he had been called up to the Italy squad by Cesare Prandelli for their Euro 2012 qualification matches after an injury to Domenico Criscito, and he would join up with the squad after this match. There were a number of changes to the team that beat Sampdoria, with Danilo D'Ambrosio, Kamil Glik, Migjen Basha and Giulio Ebagua all coming into the starting eleven. The first half was particularly quiet, with Grosseto being content with putting ten men behind the ball and attempting to hit Torino on the counter. Therefore clear cut chances in the first half were limited, with the best chance probably coming from Manuel Iori's teasing free kick, that Kamil Glik failed to make contact with. In the second half, Grosseto came close to opening the scoring when former Torino midfielder Paulo Zanetti hit a half volley from long range, but Ferdinando Coppola was able to turn around the post. The turning point of the match occurred with just ten minutes left, when Grosseto substitute Luigi Consonni was sent off for two yellow cards, having just been on the pitch for 23 minutes. And the impact from that dismissal was immediate, as from the resulting free kick, Angelo Iorio headed into his own net to give Torino the lead. Against Grosseto's ten men, Torino had numerous chances to extend their lead in the closing stages, with Mirco Antenucci, Giulio Ebagua and Manuel Iori all going close. However, the game ended 1-0 and that was enough to give Toro all three points, and put them top of the Serie B table after eight games. After the fantastic performance and result against Sampdoria, Torino return to action of Wednesday eager to continue their good form at home to Grosseto. Whilst on paper, this looks like an easier game than the fixture against Sampdoria, Torino should be weary, that like themselves, Grosseto are also unbeaten this season, and sit just four points behind them in 5th place. In their last match, the Tuscan side conceded a 95th minute equaliser to draw 3-3 at home to Ascoli, so their confidence may have been dented. However, they also have a striker in form, in the shape of former Arsenal player Arturo Lupoli who scored twice in that match. Unfortunately for Torino, they will be without one of the goalscoring heroes from Friday night because Sergiu Suciu picked up an injury in that match, and will be out for a month. Although the team is not expected to change drastically from their last outing, there are rumours that Danilo D'Ambrosio and Kamil Glik could come into the starting eleven, whilst Alessandro Sgrigna and Giulio Ebagua will also be eager to gain a starting position. Torino produced a magnificent second half performance as they came back from behind to beat Sampdoria 2-1 on Friday night, a result that took them to the top of the Serie B table. The Luigi Ferraris in Genoa is one of the more picturesque stadiums in Italian football, and a large crowd had come to see this clash between two sides who were both unbeaten in their opening six games. Torino made a number of changes to the team that were victorious against Nocerina, with Valerio Di Cesare, Alessandro Parisi and Rolando Bianchi all returning to the starting eleven. However, perhaps the most surprising selection was in midfield, as young Romanian midfielder Sergiu Suciu was given his first start for the club. Sampdoria started the game the well, with their strike force of Massimo Maccarone and Cristian Bertani looking particularly dangerous in the opening stages. It was the latter, Bertani, who had the first opportunity of the match, but his shot from 30 yards was tipped over the bar by Ferdinando Coppola in the Torino goal. Coppola was once again forced into action as the home side began to dominate, this time the former Siena goalkeeper had to get down low in order parry Pedro Obiang's deflected shot. Sampdoria deservedly took the lead after twenty minutes, as an unmarked Andrea Costa was able to head home from Franco Semioli's cross. After taking the lead, Samp took their foot off the gas a little and that allowed Torino to get a foothold into the match. And just five minutes before half time, Torino were level, with virtually their first clear cut chance of the game. Serbian winger Alen Stevanovic dribbled into the area and his cut back found Sergiu Suciu, whose first time half-volley from 15 yards beat Angelo Da Costa in the Sampdoria goal. In the second half, Samp looked a shadow of the side who had dominated for long spells in the first half, and that allowed Torino to gain the upper hand in the match. Toro coach Giampiero Ventura was also very positive in his substitutions, as he replaced the injured Suciu, with Giulio Ebagua - a striker. And Toro were rewarded for their positivity, as with just fifteen minutes remaining, they took the lead. After a quick counter attack, Mirco Antenucci dribbled to the edge of the area and then laid the ball off to Rolando Bianchi, who took a touch to set himself, before unleashing a fierce shot into the corner of the net. Torino saw out the remainder of the match with ease, with Matteo Darmian and Angelo Ogbonna particularly impressive in keeping Sampdoria at bay. Despite starting the game very slowly, in the end, Torino were well worth the three points thanks to a magnificent second half performance. This result took Torino to the top of the table for the first time this season, but they will not have long to dwell on that achievement, as they will be back in action on Wednesday evening as they face Grosseto at home. Whilst it would be a lot like Torino to slip up in what looks like an easier game, lets hope they can continue their fine form and gain another three points.